DirecTV's iPad app is mindblowingly good. In my last post, I raved about the DirecTV HR34 media center box. You have to pay $99 for it, but it's more or less a perfect set-top box. When it's paired with an iPad and the DirecTV app.... well, you kind of have to see it to believe it. 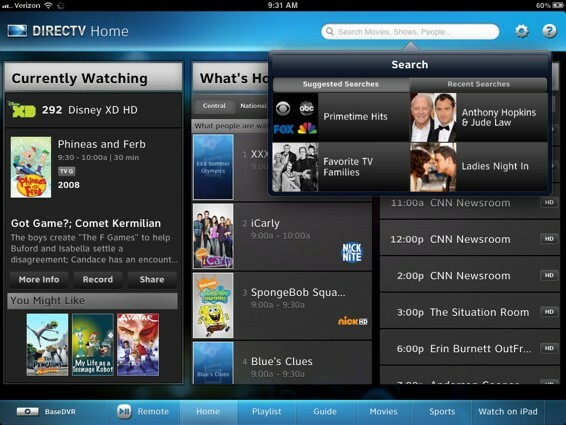 The app allows your iPad to perform essentially all of the functions of an ultra-high-end DirecTV remote control. When you start the app, you're shown what's on your TV right now - and what shows the most people are watching, both nationally and in your time zone. Click on one of the graphics for those shows, and suddenly you're watching that show, too. The primary interface is the standard DirecTV guide - you scroll through the guide with the touchscreen (with absolutely no lag), and if you click on any show's title, your receiver starts playing that show on your TV. Pick a show that hasn't started yet, and you'll get the option to record it. Switch to a list of movies that will be airing in the next month, and scroll through the movie posters - touch one, and you have the option to record it whenever it airs. Pick an on-demand movie, and you can order it and start it streaming to your receiver. This is the kind of functionality that I'd hoped for when, some day in the far-flung future, I could afford a Crestron system or some other high-end solution. And DirecTV provides it for free. (Assuming you have an iPad. Which, based on the sales figures and the fact you're reading "All Apple All Day", seems like a safe assumption. In other news, we got a contractor to spec out our wire-burying project, and I worry that the quote is a bit steep. Time to get some other bids.